Whether it is Mountain Biking or Road Cycling, Scariff and East Clare is the location. Lough Derg, which covers 32,000 acres, is one of the largest and most beautiful lakes in Ireland. Low hills and mountains with a shoreline of marvellous inlets and bays surround it. Sheltered narrow twisting roads surround the lake with intermittent villages, where one can stop off and explore the many historic sites and places of interest around the lakeshore. The route circles the entire lake. Easy riding along the route could take several days, particularly as there are so many places to stop off to view the scenery or spend an overnight. 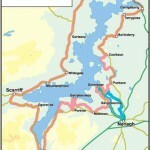 There are various cycling routes from Scariff. You can start and complete your journey at Scariff. Head toward Mountshannon, an exquisite old world village and a busy boating centre. This is a place you will want to explore before heading off towards Whitegate. Here, the road moves away from the lake and by the time it comes into view again, you have almost reached the next town, Portumna. This is a pleasant little town with a number of old ruins and a delightful Forest Park. Heading towards Killaloe, Further on, and after a short climb beyond Ogonelloe village, you can see Holy Island with its 10th Century monastic tower.